A2Z Real Estate Training is a successful fictional real estate school in a mid-sized regional market. For years, they’ve built a reputation as the premier licensing and continuing education provider. Many of the brokers in town earned their initial salesperson’s license from A2Z, and they recommend all of their recruits do the same. Their live course instructors are legendary. The owner of A2Z should feel as comfortable as any market leader can. But deep down, he can’t shake this feeling that someone’s coming for him. A few miles away, there’s a relatively new school in town called 123 Real Estate Academy. They’ve been around just over two years, and they’ve really made a splash in the industry. They’ve leased office and classroom space in a brand new building downtown, but their primary focus is on selling online real estate classes at a fraction of the price of A2Z’s traditional live class offering. Everything about this school says “modern.” Their owner should be happy with their growth, but she’s frustrated they can’t seem to shake A2Z’s foothold. A2Z looks at 123 as a real threat to their future dominance, so they compromise their identity and spend a pile of money to overhaul their image and make themselves appear every bit as “cool” as their slick new competitor. 123 looks at A2Z as a real threat to their future growth, so they create aggressive digital marketing campaigns to make themselves appear every bit as respected and professional as A2Z. Meanwhile, neither is as focused as they should be on the one thing that can actually influence their position as a leader in real estate education. 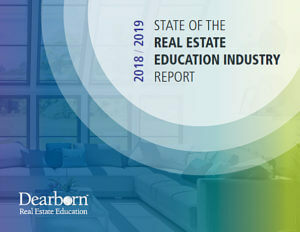 Both of these schools aim to provide the same outcomes for students: real estate licensing exam success and high quality continuing education. But both are so concerned with each other, they’re failing to identify and keep up with the demands of their students. This article will demonstrate why ignoring your competition, and developing a student-centric business model, is the best way to protect or gain market share and beat your competition. What can I do to improve student outcomes? What do my students value in an educational experience? Do my students feel the education they’re receiving is worth what they’re spending? What can I do to provide a unique student experience that’s difficult for competitors to duplicate? How should I market in a way that reflects the unique experience and value I provide for students? Once you understand what students are looking for in a real estate educator, map your capabilities to their desires. What do they look for that you already offer? That’s a great starting point. Then you should identify those things that you don’t do well today, but could do a better job providing in the future. Finally, examine the student desires that are outside your scope, ability, or interest. Now you have a pretty solid idea of who you are (and are not) going to be. The exercise above should inform your marketing plan and messaging. Build your brand around those things you provide that students want…and that set you apart. Recognize that you won’t be able to provide all things for all students. Owning 100% of the market share is not realistic. But consistently promising and delivering the student experience that differentiates your school will allow you to carve out a place all your own that will be difficult for competitors to duplicate. Perhaps completely ignoring your competition seems a bit extreme, and maybe it’s unrealistic. But if the bulk of your business and marketing plan is predicated on what they’re doing, you’re setting up your real estate school to live in their shadow. You will never be better than them at being them. But if you choose instead to carve out a student-centric identity, there’s not a competitor in town who can be better than you at being you.